Let’s be honest. You might think gift cards are tacky, but really that is exactly what everyone wants for the holidays. And numbers don’t lie. Nearly 90% of Americans have received a gift card and over 70% have given one. Also, studies have shown that most people don’t even like the gifts they are given. So instead of spending money on something they don’t like or even more stuff, get them the gift of an experience (and money they can spend). It is even a great idea for the giver, as you can save money the more gift cards you get! 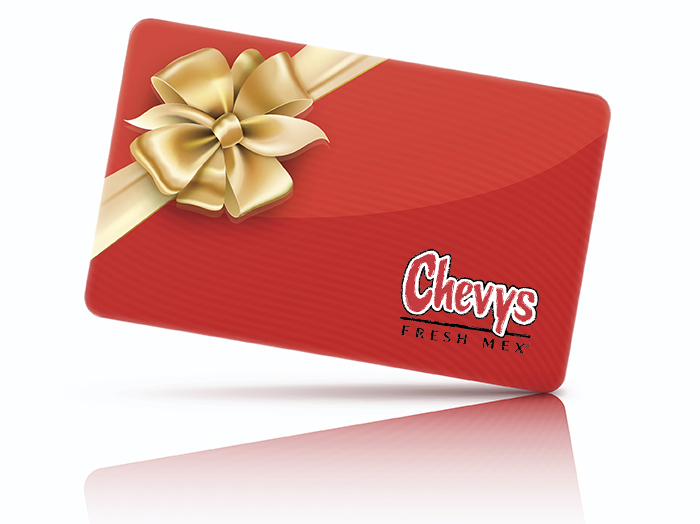 Starting November 19th, Chevys will offer a $10 card for every $50 in gift cards you purchase. Here are some key people to keep in mind for a Chevys gift card this holiday season. Who else needs money for food, and good food, than college students? When books and classes take up so much of their time, cooking gets put on the back burner. And many times a good meal is replaced with what is easy and quick. Make it simple, and get them a Chevys gift card. They will really appreciate it, especially during exam week. Teachers work hard every day to make sure our kids are learning. They work overtime they don’t get paid for, they spend money out of their own pockets for supplies, and they deal with LOTS of kids all day. So, let’s give them a much-needed break. Give them a Chevys gift card. They can spend it on a night out or maybe even a much-deserved margarita (or two). Not every company can afford a nice bonus at the end of the year, especially small business owners. However, a nice appreciate gift can go a long way. Giving them a night out, date night or even an excuse to go to happy hour is a nice holiday gift to show how much they mean to you and your business. Happy employees are great employees. Having a company party or Friendsgiving but not sure what to get for that secret Santa gift? Chevys gift card is great for anyone! From tacos to nachos, or taquitos to fajitas, there is something everyone loves at Chevys. We make real food with fresh ingredients. It’s sure to be a hit! Yum. It’s not always easy to find time to cook or be able to afford a family of 4 to go out to eat. So if you have a family you know, that might enjoy a night out, Chevys is a great place to come. We are kid-friendly with a great kid’s menu and it gives the parents a break from dinner. As parents, this would be a welcomed gift that the kids will enjoy too. These are just five types of people who would love a Chevys gift card, but really they are great for anyone on your list. People don’t find them tacky or inconsiderate. Would you? No, because a gift of Chevys means great food and great times. Contact us today to learn more about our gift card offer of $10 bounce back for every $50 in gift cards you purchase. It’s the gift that keeps on giving. Happy Holidays!